Save Money on Gas, Ride the Bus! The bridges at Inland and Nugget streets in Canyon City remain closed. The bridge at Portal Lane is closed to all but passenger car vehicles. Our buses are only able to access N. Humbolt via Main Street at this time. If you are wanting to catch the Red Line or Loop from a N. Humbolt St stop, please let the dispatcher know 541-575-2370. This detour will take a few extra minutes per loop. Thank you for your patience and understanding while the town of Canyon City works to keep us all safe! Beginning May 1st our PC/MV Route (Green Line) will begin operating 4 times a day. Departures from John Day will be 7am, 11am, 3pm and 6pm! This will allow additional travel to and from Prairie City and Mt Vernon without the extended wait times. The View the JD CC (RED) Loop Schedule here. Effective December 1, 2018 The People Mover no longer stops at the Redmond McDonald’s. 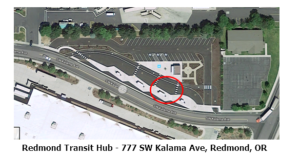 The new Redmond bus stop is at the Redmond Transit Hub located at 777 SW Kalama Ave in Redmond. We travel to Bend every Monday-Wednesday-Friday. We travel to Pendleton/Walla Walla every Tuesday. We travel to Burns the 1st, 3rd and 5th Thursday of each month. We travel to Baker City the 2nd and 4th Thursday of each month. No delays at this time. Our operating hours are 7:00 am to 6:00 pm, Monday through Friday. Saturday hours remain 9:00 am to 4:00 pm. The People Mover no longer stops at the Redmond McDonald’s. We now stop at the Transit Hub located at 777 SW Kalama Ave, Redmond. 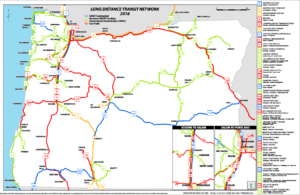 We depart the Hawthorne Street Station at 4:00 p.m.
Due to scheduling conflicts the regular board of directors meeting for Grant County Transportation District (for May) has been moved May 16, 2019 at 12:30 pm. The meeting will be held at the bus station at 229 NE Dayton St. Board meetings are open to the public. Special arrangements for accommodations or accessibility may be requested by contacting the District Manager in advance 541-575-2370. This board meeting will be preceded by the STIF Advisory Committee and Budget Committee Meetings that will begin at 11:00 am. Office hours: Monday through Friday 7:00 a.m. to 6:00 p.m. and Saturday 9:00 a.m. to 4:00 p.m.
Who we are and what we do: The People Mover is a Public Transportation service available to anyone. We serve all of Grant County. Please see Routes & Fares for more information. Or call 541-575-2370. Our John Day Valley Service is origin to destination, but meet all ADA requirements. Our Intercity Buses stops at the designated stops on the routes. Flag stops are always permitted. On the intercity bus, the driver is permitted to take you to a medical appointment in the towns that we stop in. The driver is also permitted to pick you up from that medical appointment on the return leg of the trip. Our drivers are not allowed to enter your home. Our drivers are not permitted to cross the threshold of your home to assist you into or out of your residence, or with taking packages or items inside your home. We recommend that anyone who is unable to assist themselves getting on or off the bus bring a personal care attendant with them. Care attendants ride free. Our buses and vans are ADA compliant and our drivers are trained in handling and securing mobility devices and assisting passengers with special needs. Service animals are allowed, but must be under the handler's control at all times. No open alcoholic beverages, no smoking, no vaping or illegal drugs are allowed on the buses. We do not haul freight. Passengers are required : To wear safety belts. To remain seated until the bus comes to a full stop. To provide their own child safety seat. Please see Rider Policies for additional information regarding passenger rights and rules. We now accept credit cards. (There is a $2.00 convenience fee for each transaction). This is a great way to purchase a Bus Pass or Gift Certificate for your transportation needs. It is also a perfect gift for your loved ones any time of the year!